Summer is right around the corner and it is grilling season! We have broken out the patio furniture and are gearing up for some epic cookouts! My two oldest son’s (6 years old) joined Cub Scouts this year for the new Lion Cub program. All the kids are parents are coming over this Friday for a cookout and a movie outdoors. It is a pitch-in but you know that everything I will be preparing is going to be Keto and delicious! This salad is definitely going to be making the menu. I just attended a cooking class in Lafayette, IN led by my friend Jayne. Summer salads and desserts were the theme of the class. You will want to keep you eye on Jayne’s blog for those recipes. I will just say that the “Potato” Salad and Strawberry “Pretzel” Salad are killer! Check out Jayne and her recipes at Key to Life. Truly, this broccoli salad is the thing that my wife requests most often. I think that I will make a double batch so that she can have some on Mother’s Day too. The trick is to make it ahead of time. The longer it sits, the better it tastes! It is one of those dishes that you make the day before. This side dish is the perfect accompaniment to summer grilling! I have already made this several times for barbeques at our house. Everyone loved it! 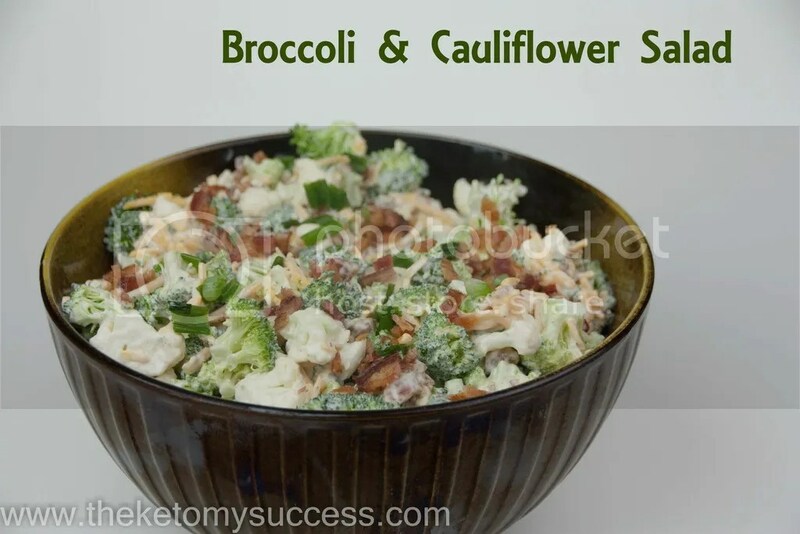 Cut cauliflower and broccoli into bite size florets. Put into a large bowl. Add diced green onions, crumbled bacon, and cheddar cheese. Mix together mayo, sweetener, and vinegar until creamy. Pour over veggies and mix. Cook time is for refrigeration time. Can be eaten immediately but taste better chilled.